I just wanted to thank you, OHA and Strong Hockey Development for all the time dedicated to the development of our Minor Midget team. It is not a coincidence that this is the second year that you have worked with our team and this is the second year in a row we have won the Gold medal in our division. When we first suggested to our team to come to OHA some parents had reservations because we were only a house league team and usually rep teams do extra development. After trying a few sessions the first year the players really enjoyed your training and wanted to continue. Your program both on and off the ice helped develop them not only into better hockey players but also into better athletes. Jake thanks for the Instructions, without you and your Leadership on the ice this Team would not have reached the goals set out by The Coaching Staff. JOHN AND MILAN…..LORNE PARK HOCKEY ASSOCIATION. See you next Season! 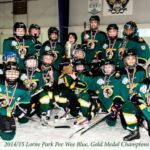 On behalf of the Lorne Park Peewee Blue 1 team I, as an assistant coach and parent, would like to thank you and your staff for all the hard work, dedication and caring that you gave to our team during this past hockey season. It is rare for 12 year olds to look forward to hard working practices and leave saying how much fun they had. Many times my son has asked me what kind of practice it would be that night and regardless of whether it was dryland or on ice, the response from him was always “Alright!!”. You have done a fantastic job with improving their skating, passing and stick work skills and with your training our team has won the gold medal for their division.